2:50 Scott DeTore (CrossFit Kryptonite) is a P.E. 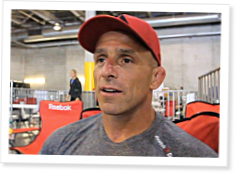 teacher/administrator in New York, but he’s also the fittest 45-49-year-old in the world after winning his masters division at the 2011 Reebok CrossFit Games. DeTore came on the show to talk about his Games experience and share his insight into how the competition has evolved for masters athletes. DeTore talked about his training and preparation for the Games, including overcoming a biceps tear, and how he has made adjustments to his training since July. After explaining some of the things it takes to open an affiliate, DeTore detailed his nutrition and divulged his secret of frozen Oreos. 29:15 Mike Warkentin is the Managing Editor of the CrossFit Journal, and he explained how a chance meeting with Pat Barber at a Level 1 Seminar early in 2009 resulted in a job with CrossFit HQ. Warkentin described some of the things he’s learned from the CrossFit community over two years in his position and how he used those experiences to open CrossFit 204 in Winnipeg, Canada. He explained how interested people can submit ideas to the Journal and what makes an idea stand out from all the other submissions. With the growth of CrossFit around the world, the CrossFit Journal is expanding to focus on more areas of CrossFit training and the CrossFit lifestyle. Warkentin talked about some of the new features in the Journal and some of the ones that are coming soon.